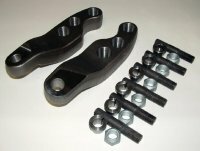 ARM SET "FORGED" 2" OVER KNUCKLE - LEFT & RIGHT ARMS WITH 6 STUDS, 6 CONICAL WASHERS AND 6 STEEL LOCKING NUTS. Designed for addition height over spring pack. These arms replace flat arms with spacers.